The Montana Department of Revenue has an important message to anyone filing Montana income tax returns for the first time: Keep your mailing address current with the department. Otherwise, your state income tax refund could get delayed. Nearly everyone who worked in Montana in 2019 is required to file a Montana state income tax return – and many people will receive a refund. 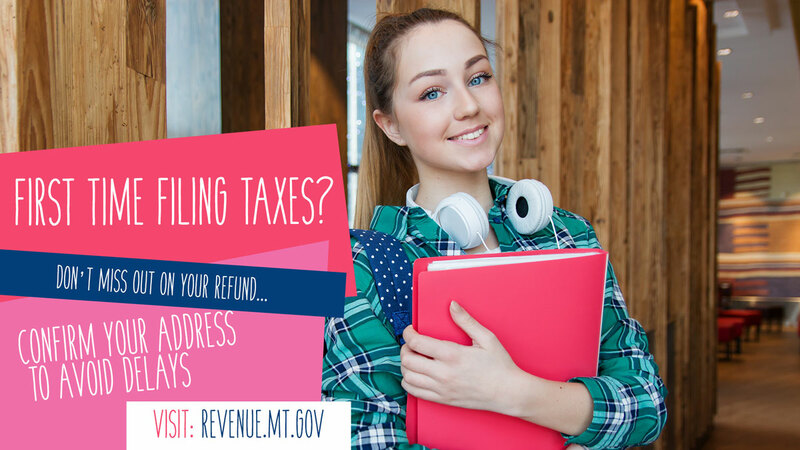 But if you change your mailing address after you file your return, please notify the Montana Department of Revenue. Here’s why first-time filers need to do this: As part of its ongoing anti-fraud measures, the department will not send refunds by direct deposit to first-time filers – just paper checks, through the mail. And, the Post Office will not forward paper checks to your next address, so just changing your address with the Post Office won’t be enough. Changing your address is easy. You can download and complete a change-of-address form at revenue.mt.gov. (Click on “Forms” and then on form ADD-CH; or just click here: https://app.mt.gov/myrevenue/Endpoint/Form/ADD-CH.) Or, call our Help Desk at (406) 444-6900. In 2018, about 2,000 state income tax refunds came back to the department before eventually finding their rightful owners. The majority of those refunds belonged to college students. And remember, the easiest, quickest and most secure way to file your tax return is electronically. The Department of Revenue lists several software options on its website, and there are organizations around the state that offer help with tax preparation, some for free or at low-cost for those who qualify. So don’t delay. Filing your return is easy, and it’s the law. File by April 15 to avoid possible penalties or interest. Call the Department at (406) 444-6900 or visit revenue.mt.gov for more information.